World Series Highlights – A’s Do It Again. Win 3rd Straight World Series. 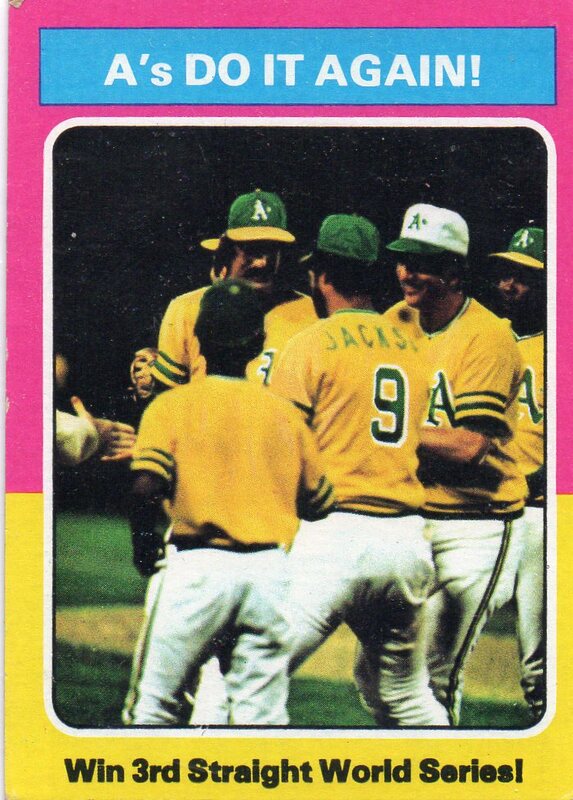 This card celebrates the championship win of the Oakland Athletics at the culmination of the 1975 World Series. The A’s, having won the 1973 and 1974 World Series titles cemented their place in baseball history as a true dynasty in the sport with their third straight championship victory. Game 1 of the 1974 World Series saw its share of great action. For the Dodgers, pitcher Mike Marshall kept the Dodgers in the game as he went 8 innings while allowing three runs. But those three runs would prove to be costly as they were one too many for the Dodgers to overcome as they faced a trio of pitchers including Ken Holtzman, Rollie Fingers, and Catfish Hunter – who allowed just two runs between them. 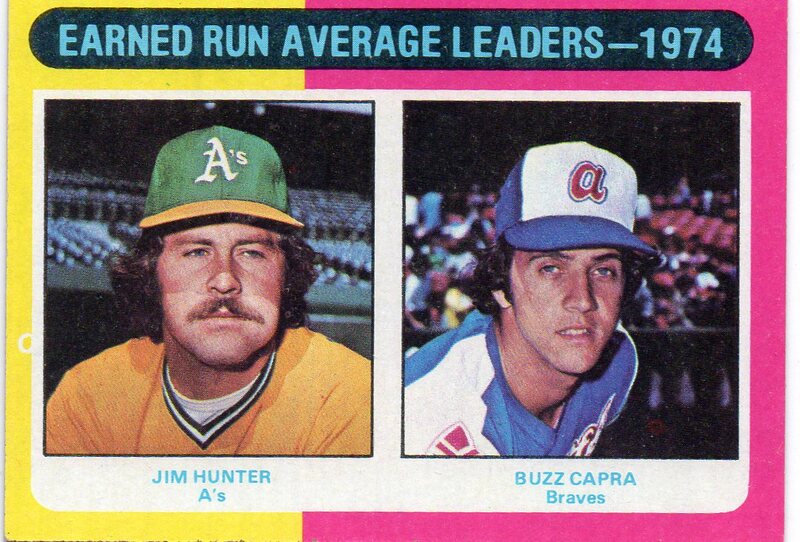 Buzz Capra led all of major league baseball with a 2.281 ERA at the end of the 1974 baseball season. He was followed in the NL by pitchers Phil Niekro, Jon Matlack, and Mike Marshall. 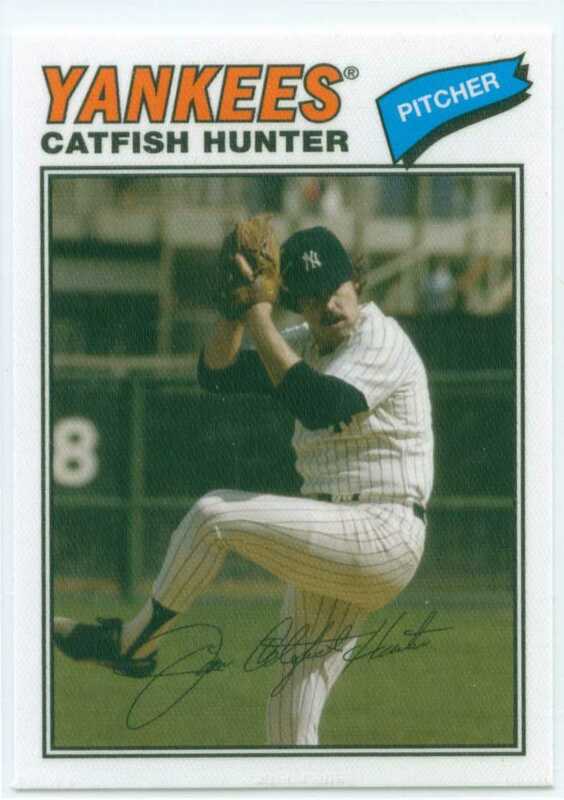 Jim ‘Catfish’ Hunter paced the American League with a 2.488 ERA. Happy Birthday Jim ‘Catfish’ Hunter!!! 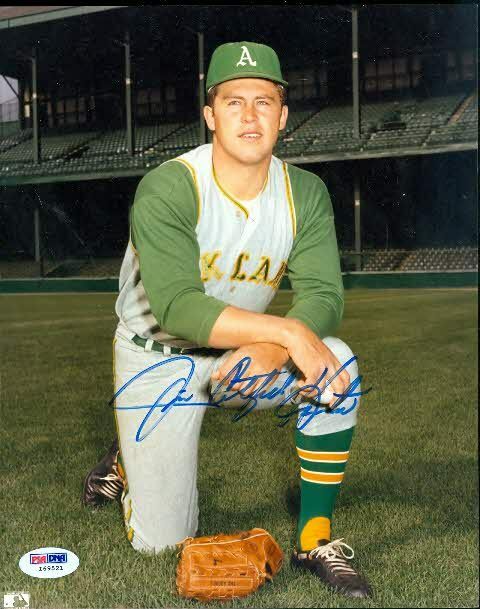 Today we celebrate the birthday of Jim ‘Catfish’ Hunter. Hunter’s Hall of Fame resume includes a 224-166 record. Catfish pitched for 15 seasons in the big leagues and was an 8-time All-Star. He won the Cy Young award in 1974 when he went 25-12 with a 2.49 ERA. Catfish won 5 World Series rings – 3 with the Oakland A’s and 2 with the New York Yankees. 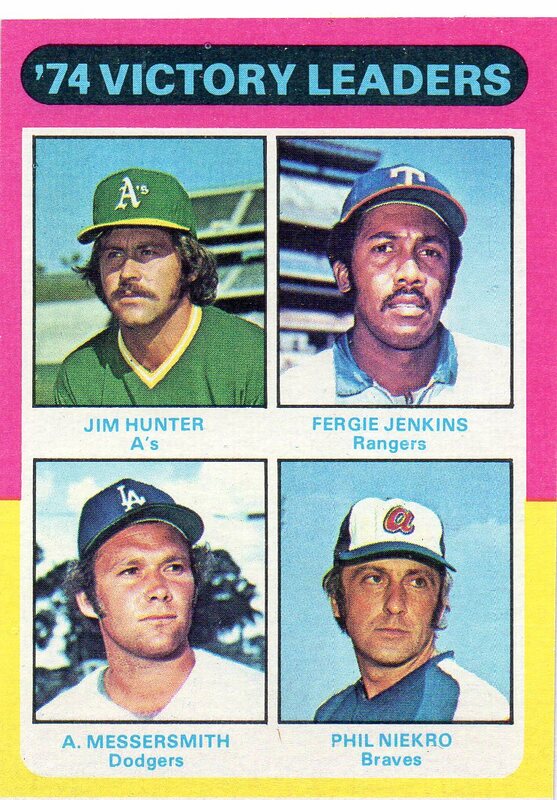 Both Jim ‘Catfish’ Hunter and Fergie Jenkins paced the majors with 25 wins during the 1974 baseball season. In the National League, it was Phil Niekro and Andy Messersmith that led the ‘Senior Circuit’ with 20 wins a piece. 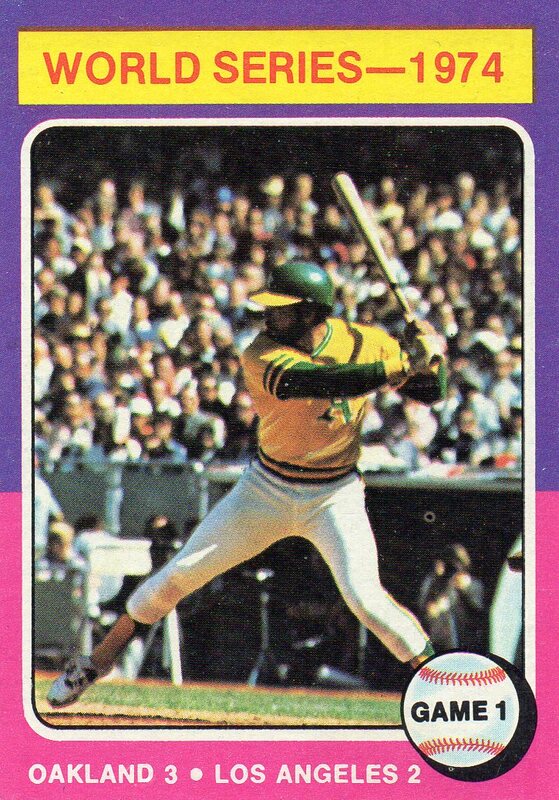 One of the things that I like most about this subset is that it looks like Topps made conscious efforts to give us images that worked with the 1977 theme. As you can see with the image used, you have Hunter in his old Yankees garb complete with a great pair of Black stirrups!